Days of Our Lives (DOOL) spoilers for the week of February 5-9 tease that several Salemites will land in harm’s way. For starters, Will’s (Chandler Massey) going to be bit too gutsy. He’ll face extreme danger after confronting John (Drake Hogestyn) about the poison plot. When Will calls John out for trying to kill Steve (Stephen Nichols), things will take a stunning turn. Days of Our Lives spoilers say John will eventually pull a gun on Will. He’ll insist that Will can’t go around making these accusations. It won’t work out well for either of them. After a trip to the DiMera mausoleum, John will point out it’s a place for the dead. A gunshot will be fired during their encounter, so maybe there’ll be a struggle. John had better hope Will’s unharmed. DOOL fans know Marlena (Deidre Hall) would never forgive John if he hurt her precious grandson. Other Days spoilers indicate that Steve will take a tumble. He’s nearing fatal territory thanks to all that poison. Steve will collapse and stop breathing, so the situation’s getting dire. Kayla (Mary Beth Evans) will put her very best team to work, but they’ll all be stumped. It seems they still won’t have a clue that poison is the culprit. Elsewhere, Lani (Sal Stowers) will have to face the music. Valerie (Vanessa Williams) knows the truth about Lani’s baby, so she’ll refuse to let her lie anymore. 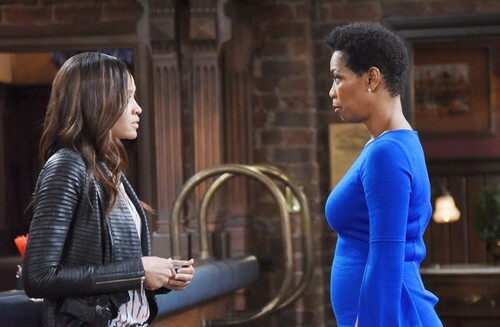 Days spoilers state that Valerie will stand up for Eli’s (Lamon Archey) rights. She’ll contend that Eli needs to know he’s the father of this child. Valerie will insist that Lani’s going to come clean right away. If she doesn’t, Valerie will just share the news herself. After mulling it over briefly, Lani will realize she’s out of options. Days of Our Lives spoilers say Eli’s in for a shock when Lani divulges her secret. She’ll reveal that she deceived him when he asked about her kid. Once Eli knows what’s up, Lani will hit him with another bombshell. She’ll plead for his silence in hopes of protecting JJ’s (Casey Moss) heart. Can Eli really turn his back on his son or daughter? We’ll give you updates as other DOOL details emerge. Stick with the NBC soap and don’t forget to check CDL often for the latest Days of Our Lives spoilers, updates and news.